Mother : Bibi Fatimah(a.s.) (daughter of the Holy prophet). Death : Martyred in Karbala (Iraq) at the age of 57, on friday, 10th Muharram 61 AH (680 AD) and buried there. IN THE house of the Holy Prophet(pbuh&hf), which presented the best image of both the worlds – the heaven and the earth – a child who benefited humanity as if he was Divine Impression reflecting the earth, was bron on the 3rd night of the month of Shaban. His father was Imam Ali(a.s.), the best model of kindness towards his friends and the bravest against the enemies of Islam, and his mother was Hazrat Fatimah(s.a.), the only daughter and child of the Holy Prophet(pbuh&hf) who had as universally acknowledged, inherited the qualities of her father. 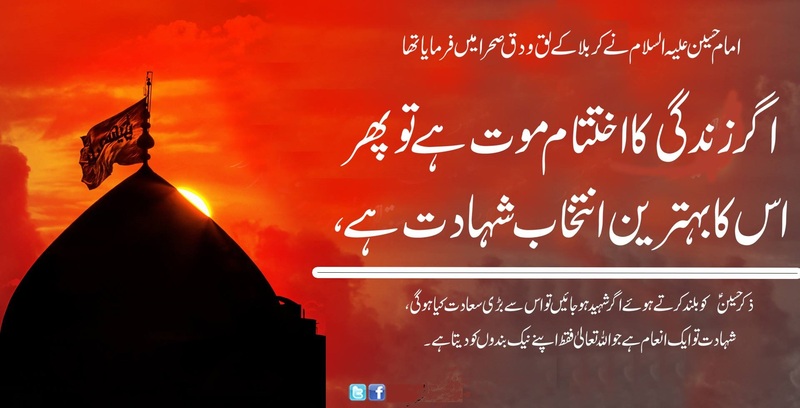 Imam Hussain(a.s.), is the third Apostolic Imam. When the good news of his birth reached the Holy Prophet(pbuh&hf), he came to his daughter’s house, took the newly-born child in his arms, recited adham and iqamah in his right and left ears respectively, and on the 7th day of his birth, after performing the rites of aqiqah, named him al-Husayn, in compliance with Allah’s(swt) command. Hassan(a.s.) and Hussain(a.s.), the two sons of the Holy Imam Ali ibn Abi Talib(a.s.) and Hazrat Fatimah(s.a.),our Lady of Light, were respected and revered as the “Leaders of the Youths of Paradise” as stated by the Holy Prophet(pbuh&hf). Imam Hussain(a.s.) sent out his companions from his camp one after another to fight and sacrifice their lives in the way of the Lord. Lastly, when all his men and children had laid down their lives, Imam Hussain(a.s.) brought his six- month old baby son Ali Asghar(a.s.), and offering him on his own hands, demanded some water for the baby, dying of thirst. The thirst of the baby was quenched by a deadly poisoned arrow from the brute’s forces, which pinned the baby’s neck to the arm of the helpless father. At last when the six-month old baby also was killed, Imam Hussain(a.s.) addressed Allah(swt): “O Lord! Your Husayn has offered in your way whatever your had blessed him with. Bless Your Hussain, O Lord! with the acceptance of this sacrifice. Every thing Hussain could do till now was through Your help and by Your Grace.” Lastly Imam Hussain(a.s.) came into the field and was martyred, the details of which merciless slaughter are heart rending. The forces of Yazid having killed Imam Hussain(a.s.), cut and severed his head from his body and raised it on a lance. The severed head of the Holy Imam(a.s.) beagn glorifying Allah(swt) from the point of the lance saying,` Allahu Akbar’. “All glory be to Allah Who is the Greatest!” After the wholesale, merciless and most brutal slaughter of the Holy Imam(a.s.) with his faithful band, the helpless ladies and children along with the ailing son of Imam Hussain(a.s.), Imam Ali Zain-ul-Abideen(a.s.), were taken captives. Hassan(a.s.) and Hussain(a.s.) are the leaders of the Youths of Paradise. Hussan(a.s.) is from me and I am from Hussain(a.s.) , Allah befriends those who befriend Hussain(a.s.) and He is the enemy of those who bear enmity to him. Whoever wishes to see such a person who lives on earth but whose dignity is honoured by the Heaven dwellers, should see my grandson Hussain(a.s.). O my son! your flesh is my flesh and your blood is my blood, your are a leader , the son of a leader and the brother of a leader; your are a spiritual guide, the son of a spiritual guide and the brother of a spiritual guide; you are an Apostolical Imam , the son of an Apostolical Imam and the brother of an Apostolical Imam; your are the father of nine Imams, the ninth of whom would be the Oaim (the last infallible spiritual guide). The punishment inflicted on the murderer of Hussain(a.s.) in Hell would be equal to half of the total punishment to be imposed on the entire sinners of the world. One day the Holy Prophet ascended the pulpit to deliver a sermon to his associates while Imam Hussain(a.s.) and Imam Hassan(a.s.) were sitting before him. When address was over, he put his left hand on Imam Hussain(a.s.) and raising his head towards Heaven, said:”O my lord! I am Muhammad Your slave and Your prophet, and these two are the distinguished and pious members of my family who would fortify my cause after me. O my Lord! Gabriel has informed me that son Hussain would be killed. O my Lord! bless my cause in recompense for Hussain’s martrydom, make him the leader of the martyrs, be You be his helper and guardian and do not bless his murderers”.